A huge thank you goes out to Majestical Jewelry for providing the piece to be styled in today's post. After this long, seemingly never-ending winter, I am certain I can not be the only one who cannot wait to break out the spring wardrobe. The fun colors, the cute prints...there is truly nothing better to bring a little life back into the world after this frigid season. Personally, when it comes to bringing life back into my wardrobe, one of my favorite ways to do so is by adding a fabulous statement necklace. Sure, small pendants are great for day to day wear, but it is incredible how much a bold piece of jewelry can take a simple outfit to the next level. 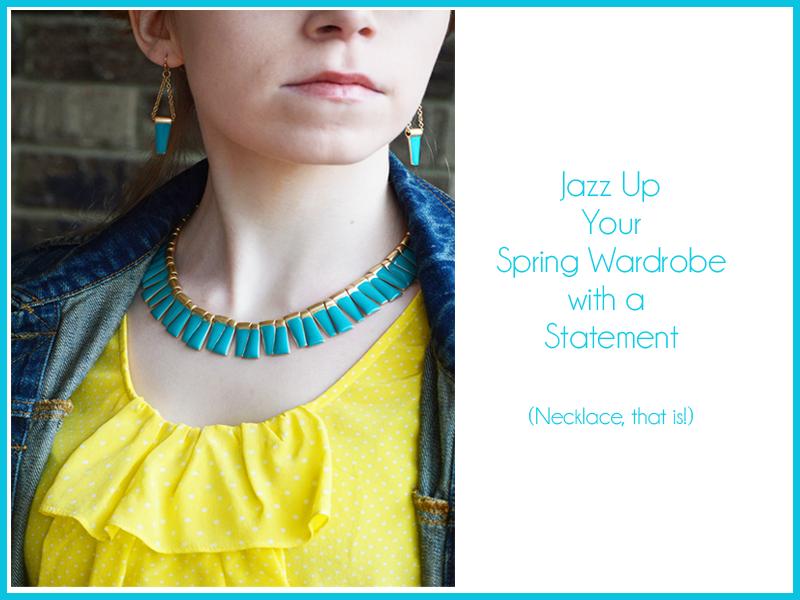 Today, I'm sharing four easy tips for jazzing up your spring wardrobe with a statement necklace. When picking the perfect statement necklace, start by thinking about the colors already in your wardrobe. Personally, when I buy a statement necklace, I want to be able to mix and match it with as many items in my wardrobe as possible. 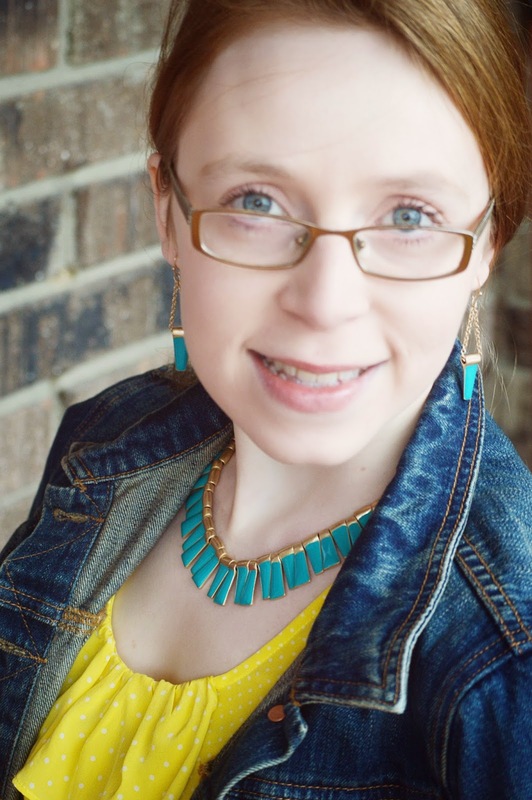 Frankly, I have this amazing red necklace that I would wear daily if I could, but (though red is one of my favorite colors), there is little in my wardrobe that actually works well with it. Your jewelry does not need to be a perfect matching set with your wardrobe, but it does need to coordinate well. Personally, I love a fun unexpected pop of color too. 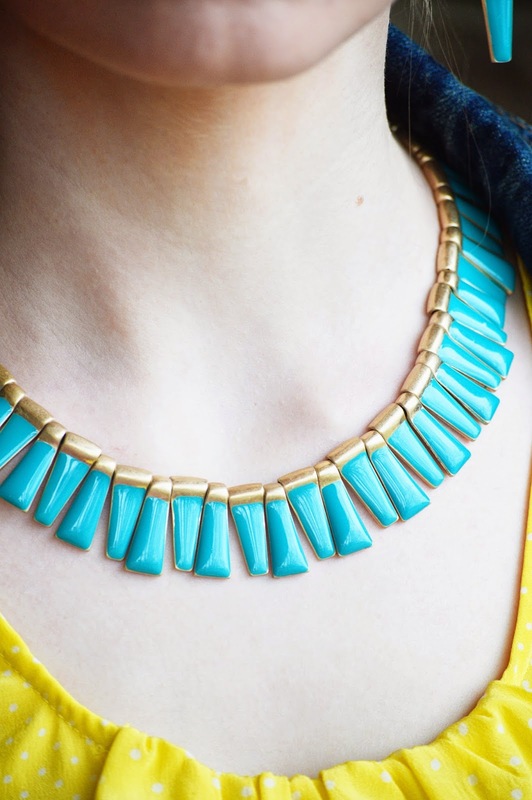 I have a lot of vibrant colors in my personal wardrobe so the teal necklace I'm styling today is a great addition to my personal wardrobe. Aside from the yellow I'm pairing with here, it will also look great with a bright green, fuchsia, coral...the possibilities are endless! Now, we're not just talking color, but styles too. When I first started looking at statement necklaces, I found myself saying, 'Sure, these look great on the models, but are just too much necklace for ME'. Remember, this is a STATEMENT necklace, it's supposed to stand out! From bright colors to different styles, don't be afraid to try something new and mix it up a bit. Still worried about going overkill on the jewelry? Choose one area for your statement piece, and keep the rest simple. For me that usually means a big necklace, and going lighter for my earrings and bracelets. For others that might mean a fantastic pair of statement earrings or amazing arm candy. Mix it up, keep it fun and be confident in the style you choose. The trouble with a great statement piece is that they can get a little price-y (another great reason to choose a color and style that will give you a lot of options). The good news is, they don't have to. This particular set from Majestical Jewelry retails for $37 and is just one of the great pieces they have to offer. You'll find the same great styles you would find at popular high end stores, without the high end price tags! Majestical Jewelry allows women to buy at wholesale prices- anywhere from 20-80% cheaper than competitors...wouldn't you rather have 2-3 great pieces for the same price as just one? I know I certainly would! Remember, fashion is supposed to be fun so it's perfectly okay to not take it too seriously. Try something new...and own it. If it doesn't work, try try again! To help brighten up your spring wardrobe, Majestical Jewelry is offering all of you $15 off your order of $55 or more. Simply enter the code, 15DOLLARSOFF at checkout!! And two very lucky readers will also each win a $10 gift card to put towards their purchase. Enter using the Rafflecopter form below. Disclosure: I received the above mentioned product in exchange for this post. I was in no way required to write a positive review. All thoughts and opinions are 100% my own. I would buy the Crystal Droplets necklace!